Many parents spend sleepless nights planning for their kid’s birthday party. Birthday parties for kids are like attending a prom! It’s the highlight of their life at that age. Simply said, their birthday party is the event of the year! Nothing can go wrong! With the current advancement in technology, kids nowadays are definitely more demanding and are no longer accepting for a ‘normal’ birthday party. A themed birthday party with their favourite cartoon character on the cake is no longer sufficient. They want something unique, something that will make their friends in school green with envy and become the talk of the town. Well parents, we can’t totally blame them either. After working so hard, ultimately you would also like to do the very best for your kids and nothing brings you more joy than seeing your child happy. And what parents can’t take is the mess after the party, we know how it’s like to see the stains of sauces and sprinkles on your carpet and floorings right after the party and it made you wonder if you made the right decision in doing the party at home. After spending so much effort in planning and executing, now there is a Part 3 to it which is cleaning! Oh no!! So, parents… What if we tell you that there is an easier way to deliver an unforgettable birthday party for your kid while still keeping your sanity in check and have the ability to relax throughout the party? We present to you our party buses! MaxiCABooking SG is the very first to provide mobile kids party buses on the move! Take the load of yours shoulder this year and let us plan your kids’ birthday party for you. We assure you that we will make your kid the happiest kid on that day! 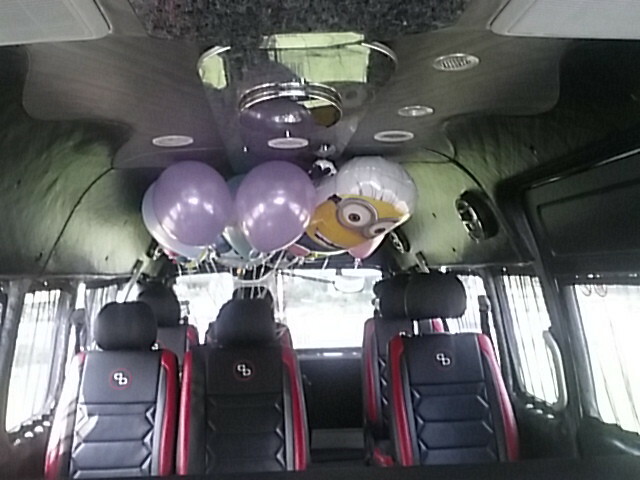 We have two types of party buses in our fleet to offer different levels of experience for your kids birthday party. Standard Party Bus: (basic interior with mid-range sound systems, lights & disco effect) Suitable for up to 12 kids – our standard party bus Each of our party bus comes with unique, individualised and different customise interiors for you to choose from to suit your party theme. Party on the Go with us and be mesmerised by effects created by the laser lights and smoke machine, matched with high-end sound systems that will make the kids go wild! Premium Party Bus: Imagine having all that the standard party bus offers plus more! Decked with a luxurious interior, amazing high-end sound system and laser lights – you see this right, we have all it takes to party in our premium party buses! Oh wait, we forgot to add that this range of party buses also comes with their very own 32 inch TV for music videos and karaoke! Worried that this will burn a hole in your pocket? Well we can guarantee you that it won’t! We at MaxiCABooking SG have many different packages to cater to your budgets. Not only that, our party experts will also be able to advice and customise the best kid’s birthday party for you! Reach out to us to take the headache away! Our party experts are just a call / whatsapp or email away. Create the ultimate birthday party for your kid now! This entry was posted in party bus and tagged book a party bus, karaoke party bus, party bus, party bus 13 seater, party bus booking, party bus company, party bus hotline, party bus rates, party bus services, party bus singapore, party limobus, party van, party van hotline, singapore party van. Bookmark the permalink.